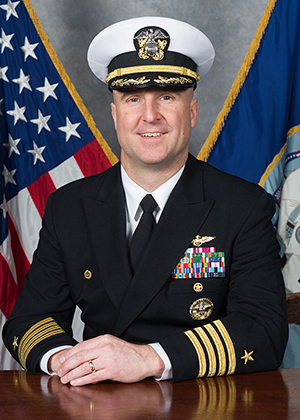 A native of Corvallis, Oregon, Captain Sisson received his commission in 1993 from the University of Colorado Naval Reserve Officer Training Corps, where he earned a Bachelor of Arts in International Affairs. He was designated a Naval Aviator in 1996. Captain Sisson’s operational assignments include tours with Strike Fighter Squadron 192 (VFA-192) as a junior officer, and Strike Fighter Squadron 27 (VFA-27) as a Department Head. He has completed nine deployments on various ships to include USS Independence (CV 62), USS Kitty Hawk (CV 63), USS Ronald Reagan (CVN 76), USS George Washington (CVN 73), and USS John C. Stennis (CVN 74). Sisson has logged over 3,800 flight hours and has accumulated more than 1,000 carrier-arrested landings. He commanded Strike Fighter Squadron 115 (VFA-115), based out of NAS Lemoore, California and NAF Atsugi, Japan. He also commanded Carrier Air Wing NINE (CVW-9) based out of NAS Lemoore, California. His shore assignments include instructor pilot at Strike Fighter Squadron 122 (VFA-122); Strike Fighter Placement Officer at the Bureau of Naval Personnel; Operations Research Analyst in Cost Assessment and Program Evaluation (CAPE), working for the Office of the Secretary of Defense; and Battle Director in the Combined Air and Space Operations Center. He completed Joint Professional Military Education Phase I through the Air Force Command and Staff College correspondence program. He graduated with distinction from the United States Navy War College, earning a Master of Arts in National Security and Strategic Studies. His personal decorations include the Legion of Merit, Defense Meritorious Service Medal, Meritorious Service Medal, two Strike/Flight Air Medals, and other personal, campaign and service awards.